Dressing up in Mommy and me clothing is one of favorite parts of my week. It is fun to do all year long! Here are some ideas and way to match with your daughter. Let’s start with a simple combination that you might already have your wardrobe! You can match your child by coordinating colors. In the spring opt for pastels, summer opt for bright colors, and in the fall and winter go for neutrals like grey, navy, burgundy, and black. You will see that certain colors are in each year. When trying to match, look for colors that are available everywhere. Pantone colors of the year are some color that you will find throughout the year. My favorite mommy and me clothing is from Lilly Pulitzer. They make tons of sizes from infant to women’s 14. There is even a section on the site that is for mommy and me. Check it out HERE! They always have so many gorgeous prints out. Sometimes they even make prints for boys and men. Lilly Pulitzer dresses last forever because they are so well made. You can easily pass your clothes down to family members or sell them online after your child grows out of them. My daughter usually gets them oversized and then eventually wears the dresses at long tunics over stretch pants. Get ideas on how to wear Lilly Pulitzer from my blog post. 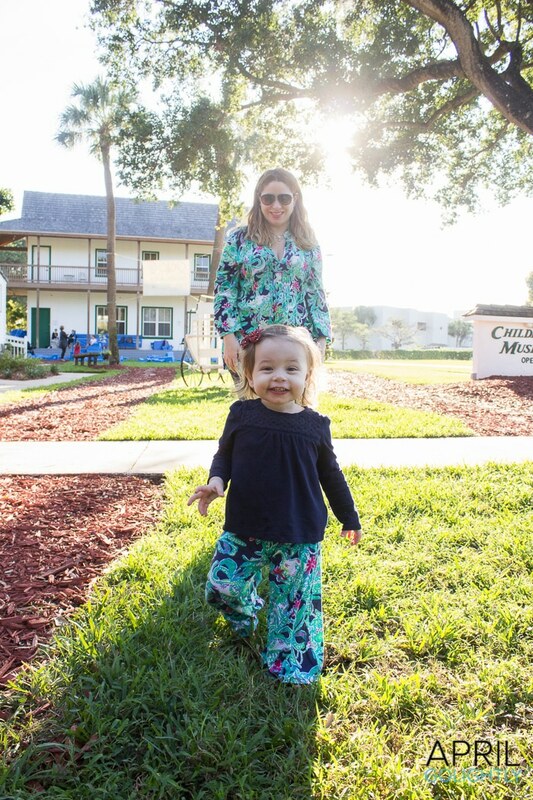 Check out our Lilly Pulitzer mommy and me picks here. You can also find mommy and me clothes is from Old Navy. They have an amazing selection of matching prints that they come out with every season. I like that you can get multiple pieces in a print to match. Every season there are a few prints that you can find to match. The mommy & me clothes come in everything size you could be looking for – Women, Plus, Baby, Toddler, Girls, and even Maternity. Sometimes they even come in petite and tall. The best selection is online. I have found that the selection is online. To find the matching prints you have to hunt the site with a fine tooth comb to find the matching prints because the website does not name the prints the same across the website. Bookmark this page and I will update the looks from Old Navy as I find them. After all, I am always on the hunt for matching mommy and me looks. Shop our favorite Old Navy Mommy and Me pieces here (updated monthly). If you haven’t heard of Etsy, you definitely need to spend some time checking it out! There are a ton of shops that sell Mommy and Me looks that you can customize to your size. You can find everything from simple dresses to fluffy tutus for mom and daughter. There are a few shops that have amazing matching looks! Shop our favorite Etsy Mommy and me picks here. These Etsy shops have the cutest matching mommy and daughter swimsuits. I literally want every single one of them! I fell in love with the prints from Be JAD collection. The flamingo print and the banana leaves are just so stinking cute. OMG and the unicorn print! I need all of them! See all the prints here. On Etsy you can find everything from macthing mouse ears to matching headbands (like mine). The Pineapple Clothing company is based out of Miami and has tons of awesome prints to choose from. You can get everything from Mommy and me matching dresses to matching workout leggings with sports bras. So far, I have gotten a pair of matching leggings in the palm print and blue floral print dresses. I am dying to get the unicorn prints matching as well. Get 20% off with the code aprerh by clicking here to shop. If you have the means, Dolce & Gabbana always blows it out of the park with their matching mommy and me outfits. Whatever print they choose comes in everything under the sun from matching shoes to dresses and even bathing suits. They are even making high-end Dolce & Gabbana purses that I am not sure I can live without! Saks has a pretty good selection of Dolce & Gabbana kids and Dolce & Gabbana for Women. I have found that you can find matching prints from Lularoe. They have really cute dresses like the Lularoe Amelia for women and Lularoe Adeline Dress o or the Lularoe Dot Dot Smile for your little girls.